How do solar panels work at night or during cloudy days? After reading about all the great advantages of solar energy, you may be thinking about installing some residential solar panels. And that’s fantastic! But we’re sure you have some questions before going forward with the buying process. A frequent inquiry that customers ask is how do solar panels work at night? Whether you plan on relying solely on your panels to generate electricity or will have additional resources of energy, its important to understand how solar panels work and what you should expect from your system. Solar panels can’t produce power without sunlight, so the photovoltaic cells on your roof will not be actively generating electricity in at night. However, with an efficient system, your solar panels will generate excess power during the day and deposit it back onto the utility grid, which you can get credit for each month. Then at night you’ll draw power from the utility grid, just as you did before you installed solar panels. But the power you’re using at night will be offset by the utility credit you earned for producing power with the sun out! This whole process is referred to as net metering. If you’re living completely off the grid, and independent from utility providers, solar storage technology, like batteries, will be a good option. A back-up system like this will store the energy until you need to use it. Solar storage solutions are continuing to develop with a number of affordable and efficient products coming onto the market. 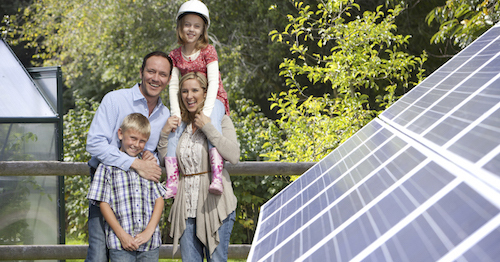 So how exactly does installing residential solar panels save you money? This is where net metering comes even further into play. The power that your panels harvest during the day is clean, sustainable energy with the bonus of being totally free! You will make back the money invested to install panels on your rooftop with the savings you’ll receive producing your own energy, and not paying the utility company’s incredibly high rates each month. Plus with a good net metering policy, you’ll be receiving credits for all the excess power you return to the grid to pay for the power used at night. Our solar savings calculator can provide insight into your current energy use and how much switching to solar power can save you each month and year. For those states that don’t have favorable net metering policies, you can ask your solar installer to include a battery when you request a quote. The short answer is yes, but not as well. You’ll obviously generate more power in a shorter amount of time in sunny places like California and Hawaii, but solar panels are perfectly capable of capitalizing on diffused solar rays that come through cloud formations. On a cloudy day, your solar power system will probably generate 10-25 percent of their rated capacity. But just because you don’t live in Florida, you certainly shouldn’t neglect installing a solar power system. What matters is the amount of sunshine you get over the entire year, not a particular day. Portland, for example, gets just as much sunshine as the average U.S. city over a full year despite its rainy winters. Installing solar panels on your roof is a great investment toward a greener, more sustainable future. There are many elements that contribute to receiving a full return on your investment, but no matter what, you’ll be helping to reduce your carbon footprint and the amount of fossil fuels burned for electricity. To receive exact quotes on how much a solar system would cost for your home, fill out the form at our solar power marketplace, 123SolarPower, to speak with certified solar experts in your area.